This post is Day 2 of Vibrant Homeschooling’s “12 Days of Christmas Teachable Moments” series. Click here to access previous posts in the series. What would you do if Christmas cards were illegal? That probably sounds like a strange question, doesn’t it? I mean, who would ever think Christmas cards could be against the law? Can you imagine living in a place where singing a Christmas carol or even mentioning the name of Jesus could take you from your family and put you in prison? How can we, as Christians in a free nation, respond? And how can we share this great need with the children in our lives without burdening them with details too graphic for their age and maturity? The first thing we must do is pray. It’s the one thing persecuted Christians ask for the most, before food, clothing, blankets, or even freedom. You can find stories of Christians in need of prayer at many sites such as Gospel for Asia, The Voice of the Martyrs, and Open Doors. Read their stories and decide how much is appropriate to share with your children. The Voice of the Martyrs also has a site called Kids of Courage. It is written specifically for children and very sensitively shares the stories of children and their families, prayer requests, and ways children can help. Does your family send Christmas cards or letters to loved ones? Would you consider sending a special letter to a Christian who is in prison for his or her faith? Through the Prisoner Alert ministry of The Voice of the Martyrs, your family can write letters in English from a long list of pre-selected phrases and Bible verses that are immediately translated into the prisoner’s native language. You print and mail the letter, which typically costs just over $1. Sometimes the prisoners receive the letters and are encouraged. Sometimes God uses the letters to speak to the guards in the prison. And sometimes, He uses the letters to get the prisoners the help and care that they need. But what about the Christians who must remain anonymous to us, who live in places where ministries are underground and cannot share personal stories or details? Is there a way we can remember to pray for them? There is, and there is a special way we can do it at Christmas time. A few years ago, I made a craft called a Silhouette Prayer Card as a way to remember to pray for the Christians whose suffering is known only to God. It’s a simple craft that can easily be adapted into a special Christmas project. Have your child draw a picture of the outline of his/her face on a piece of black construction paper. Or, have the child cut out just his/her face from a printed photograph. Then, using the white pencil, trace just the outline of his/her face on a piece of black construction paper. Have the child cut out the outline of his/her face. Glue the silhouette picture onto the front of the Christmas card. Display these Christmas cards with the other cards you receive this Christmas. Use them to help you and your children remember to pray for the Christians whose names and faces we may not know. As a family, pray faithfully for all the people who are suffering because they love Jesus. If we seek God’s face and ask for His help this Christmas season, we can find ways to be a blessing to the persecuted Church now and throughout the coming year. 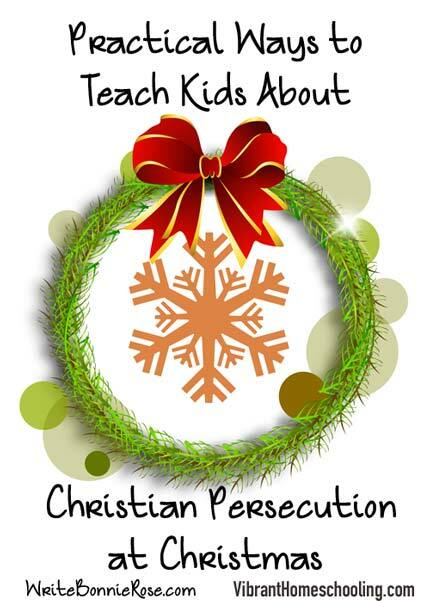 If you’d like another free way to learn about the needs of the persecuted Church, I’d love for you to download my free unit study, A Martyr’s Christmas. It’s written for elementary-middle school aged children and is a simple way to explore Colombia, India, Turkey, and Algeria while meeting men and women who have suffered for their faith in Christ at Christmastime.